Get control of you r percentage Gates! Put some SMARTS into your gates! SmartGate puts intelligence right at the gate so it is always at the correct position. By using a network-based design, the system is significantly less expensive to install in both new applications and existing facilities. Easy Installation The SmartGate system consists of a host controller that controls up to 100 gates. Instead of running individual power, limit switch and analog cables to each gate from the MCC Room and PLC, a 4-wire communications cable and a power cable are daisy chained from one gate to the next. Although it is not typically necessary, all gate parame-ters can by adjusted from the host controller. Intelligent Instead of requiring the PLC to constantly check the position of every gate, each gate has its own controller that corrects itself. Linear and Rack & Pinion Linear style actuators use single-phase 110 VAC power and are normally suffi-cient for most applications. Where more torque is required, SmartGate can be fitted to a 3-phase power rack & pinion gate. New Installations and Retrofit SmartGate is the perfect solution for new facilities because of its lower wiring costs and because it does not need an additional reversing motor starter, saving additional cost and space in the MCC Room. With its bolt on design, SmartGate can normally be added right below the existing gate by simply adding a transition. This double gate solution provides for additional maintenance flexibility. Digital Technology The A/D conversion is done right at the gate controller, with internal diagnostics con-stantly checking for proper operation. Using digital technology results in a more stable and accurate reporting of the actual gate position. 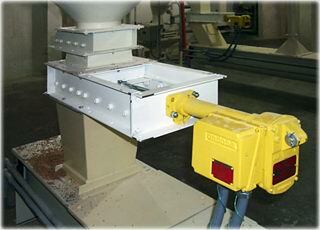 RS485 communications are used for multiple gate applications. 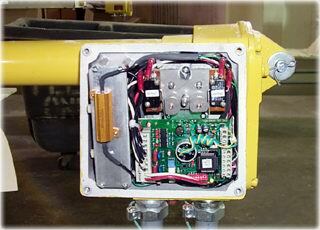 Auto Calibration Once the full open/close limit switches have been set at installation, a gate actuator can easily be calibrated by pressing the button on the actuator, or remotely on the host controller. The gate will run a calibration routine and automatically set the zero and span points to provide a linear position feedback of the gate opening. Calibration setpoints are stored both locally in the gate controller and in the host controller. Class II Group G The linear actuator version of SmartGate is ideal for explosion-proof areas like grain elevator basements. 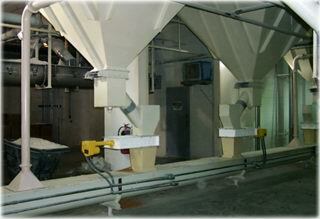 It also works great with open and closed type conveyor systems. Easy Expansion Each gate controller has a user programmable ID number so that the host controller can recognize it. Adding an additional gate is as simple as daisy chaining the wiring from the nearest gate and assigning a new ID number. Automation Integration For simpler systems, all the gates can be controlled from the SmartGate Host controller. 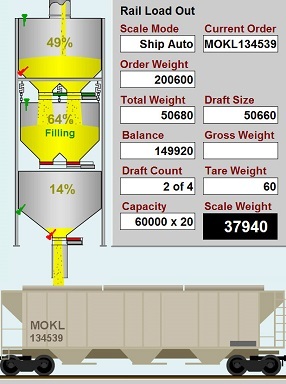 Integration to PLC and HMI systems is easily accomplished by using the built-in Industry standard ModBus communica-tions allowing for real time animation of the gates on the computer screen. A discrete permissive input is also avail-able to prevent gates from opening when conditions are not set.